On my final stop of a two-month holiday, I can think of no better place on earth to relax and contemplate my future than Queenstown, New Zealand. 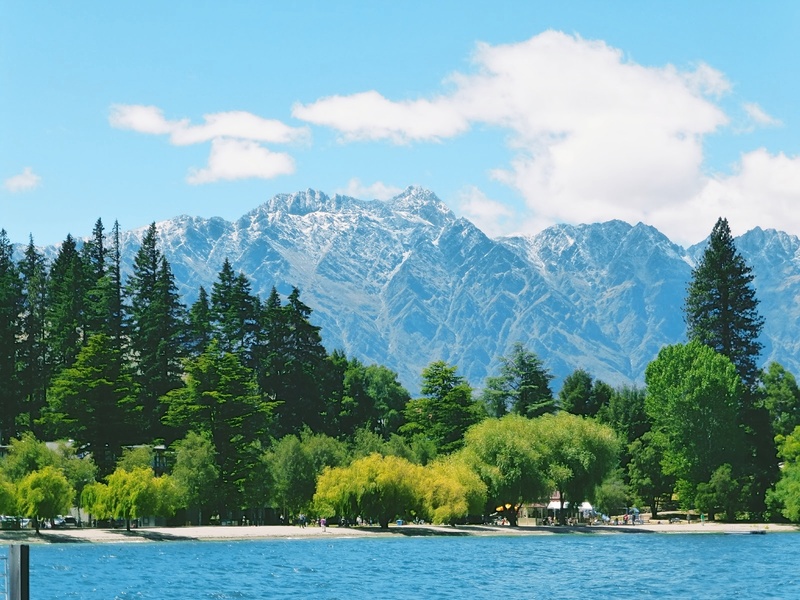 A resort town located on the country’s South Island, Queenstown is known for tranquility, adventure sports, outdoor activity (skiing in winter, hiking and biking in summer) and genuine beauty. It is situated on Lake Wakatipu and is surrounded by breathtaking mountains most covered with clusters of towering evergreen tress and lush vegetation, while others peaks remain snow covered year round. One mountain range seems perfectly named, the Remarkables. The locals believe the early settlers named the range the Remarkables upon seeing the “remarkable sunset” on the mountains one evening. I agree. 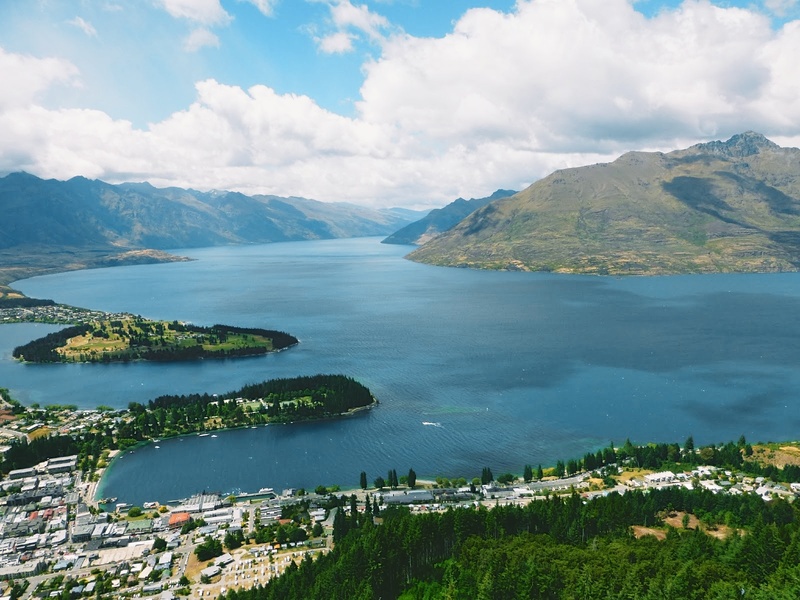 Queenstown has a population of roughly 23,000 people but that doesn’t count the influx of tourists from Australia and around the world in the peak winter and summer months. The indigenous Maori population is very small in Queenstown numbering only about 1,300. *It’s suggested the Maori’s arrived in New Zealand in the 13th Century AD from Eastern Polynesia. This is a place where everyone knows your name and if they don’t give it a day. It’s an appealing lifestyle on many levels if only the jobs paid a decent wage. Salary workers, short-term holiday workers and backpackers make up the bulk of the economy. My 25 year-old concierge told me he was “getting out” in the next month. Here I thought he was moving to Auckland or Australia or something big and he informed me he was moving to Dunedin a simple three-hour drive. Why Dunedin? He can make more money, work less and ski more. It sounds like the desired life of a Kiwi (nickname for New Zealanders) and maybe me. I first visited Queenstown with my friend Erin Garvey in 2004. We were young, spirited and full of energy. Having met on the John Kerry/John Edwards Presidential Election we developed a bond and love of travel. After experiencing defeat in Boston on that cold November rainy night, we planned a road trip through the South Island of New Zealand. It’s hard to imagine all that has transpired in eight years. Queenstown has changed. I have changed and Erin is now married with a newborn baby girl. John Kerry probably wishes he never met John Edwards and John Edwards is likely regretting his foray into politics. While Queenstown has added more restaurants, bars, shops and swarms of tourists, it still possesses the same allure and magic of a land forgotten. It’s why Hollywood beckons. An artist could not possibly produce anything more awe-inspiring than the images of Lake Wakatipu and the mountain ranges. Movies such as the Lord of the Rings Trilogy, The Lion the Witch and the Wardrobe, Vertical Limit, 10,000 BC and Prince Caspian have all been filmed in Queenstown or nearby. Just steps away from town, I could find myself completely alone away from the activity and in the presence of nature. Since my injured foot prevented me from a six-hour trek, I made the most of the easy grade walks. I hiked from the Village of Kawarau on the shores of Lake Wakatipu for two hours pondering how I could get my father to visit here and buy a vacation home–for ME! As if the gods were somehow listening to me, a fatigued out of shape version of me stumbled upon a golf course. He could surely not resist these views and these prices (it’s the only place the dollar fares well). I couldn’t help notice the clear blue skies, the manicured lawns, magnificent homes and incredible views as I walked. Every direction produced a better snapshot. A spectrum of blue reached from the shores to the middle of the lake contrasting with the trees and earthy tones of the mountainous landscape. The lake is the focal point of Queenstown. Kids play in inner tubes and swing from trees, locals sunbathe and picnic on its shores, people boat and swim and make the most of these warm summer days. While the lake is appealing, it’s cold. Most people wore wet suits and after testing the temperatures on a dock one afternoon, it didn’t take me long to figure out I would suffer from hypothermia rather quickly. The average air temperatures are 60-70F this time of year but there are spurts of 80s and 90s too. In other words, this is not a place with predictable weather patterns. I’ve been here four days and experienced spring, summer and winter all on one day. This much I recalled from my 2004 visit and was well prepared for my 20-mile bike ride. I dressed in layers and stuffed my rain gear in my backpack. The bike proved more challenging than the walk but I couldn’t resist the rolling hills and amazing views. Even the wind and rain could not stop the flow of adrenaline. I even contemplated skydiving and bungy jumping before my common sense caught up with me. What I find most appealing about Queenstown and what I appreciate about travel is the constant thrill of the unknown. I find myself on a walk, the skies are clear, it’s warm I am breathing fresh air and then the clouds descend and the rains fall. My journey starts out with a quick bike ride to town and back and I find myself eating pizza at one of Queenstown’s most famous haunts, Cow’s Pizzeria, drinking wine and wondering how I might return back to my hotel in one piece. It’s about the undiscovered for me and the search for something different. In Queenstown, I could be a tourist, ski bum or restaurant owner and people would treat me with the same kind of respect as a garbage collector. It’s the authenticity of the Kiwis that I find most attractive. Vudu Cafe serves the best Chai Lattes (in 2004 Erin and I drank chai lattes two times a day in search for the best – I thought I would give Queenstown’s newest cafe a chance) and the most delicious desserts of which I gorged myself on throughout the day. Don’t miss the carrot cake. Pog Mahones Pub to watch Notre Dame’s demise, visit with Irish tourists and catch a sunset view with a local glass of wine or mug of beer. *Pog’s is also the best place to meet strangers and that I did–loads of them. My new friend Pete is a Kiwi living in Melbourne. He’s been all over the world and had some crazy stories to share. He made me feel like a hermit. I gathered a few insights into the New Zealand culture. Pete is half Maori, half Scottish but I would have believed he was English or German too. We had a great afternoon comparing the culture of the United States and the lifestyle of the average Kiwi. Life is here is simple yet complicated. We finished the evening after a few cocktails and live music on the wharf at Tatler’s Restaurant where I should have ordered the Prime Rib but hesitated because I was in a pub. I was wrong-Big Mistake. The chicken was decent but don’t miss the prime rib with horseradish-mashed potatoes. I’m leaving for the USA today but not before I take one more stroll around the lake, breathe in the fresh air and thank all those who have given me an opportunity to experience this “remarkable” place. It’s not always the spot that you land but the journey you take. In Queenstown it’s the people, the food, the sights and sounds of nature and a small slice of perfection.